– september 2008-september 2012: I attended the Faculty of Performing Arts at Trieste’s University, specializing in Theater Studies. – september 2010-may 2011: I attended the first course of Patternmaking Technology at the Miniussi School of Trieste. – september 2011-may 2012: I attended the Dress Design course at the Miniussi School of Trieste. – may 2016-september 2016: I attended a practical course with the artisan jeweler Sossi, in Trieste. – september 2007-september 2010: I worked at costume jewelry workshop Artematta in Trieste, focusing on glass jewelry. – september 2010-march 2011: I carried out a two-day weekly internship at ENVELOPE srl in Treviso, Italy, a clothing design studio specialized in denim. 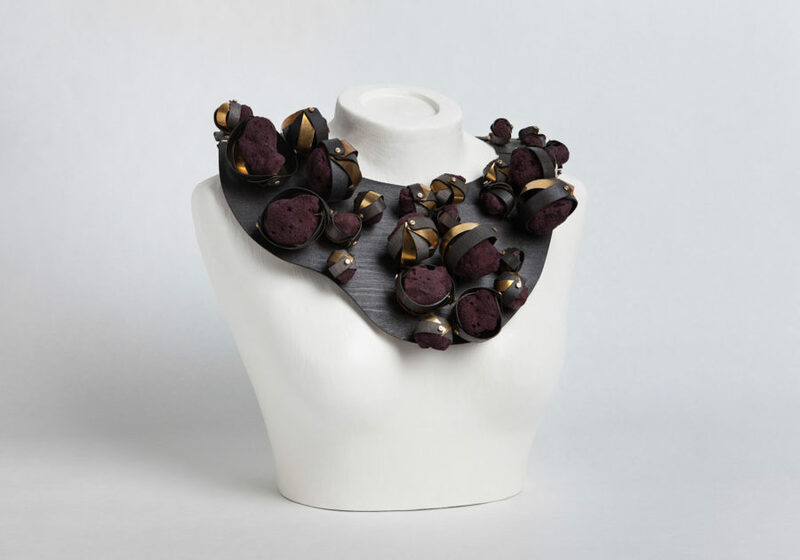 – january 2011-september 2013: with a colleague I set up a label called THE COMPLOTTO: a line of trendy accessories (mainly brooches and necklaces) in MDF (medium density fiberboard), computer-designed and laser-cut. – june 2012-september 2014: I set up my own workshop and launched my own jewelryline range calling it COLLANEvrosi. – november 2013: I opened an atelier, shared with a photographer and a graphic designer. The space works as a studio and showroom. – september 2015: I participated as an exhibitor at HOMI fair in Milan. – january 2016: I was selected to exhibit in the SPERIMENTA section at HOMI fair in Milan. – september 2016: I was selected again to exhibit in the SPERIMENTA section at HOMI fair in Milan. – january 2017: I was selected to exhibit as a YOUNG DESIGNER at Première Classe fair in Paris. – september 2017: I was selected to exibit as a YOUNG DESIGNER at Première Classe fair in Paris. – september 2017: I was selected to exibit in the SPERIMENTA PLUS section at HOMI fair in Milan. – april 2018: I was selected to exibit in the Creator’s Village section at IFF MAGIC JAPAN fair in Tokyo. – september 2018: I was elected to exibit in the CRAFT, ME’TIERS D’ART section at Maison & Objet fair in Paris. – september2015: I won the HOMI MAKER DESIGN AWARD. – september 2015: my work was shown at CONVIVIO/ TYPOS 2015, a collective exibition in Trieste. – agoust 2016: NOT JUST A LABEL invited me to exhibit my collections at BACK SHEEP, a selection of designers from the NJAL community that the scouting team have identified as being especially innovative, pioneering and striking in their work. – january 2017: I was selected by Artigianal Intelligence to exhibit at A.I. Studiò at AltaRoma Fashion Week, Rome. – may 2017: I was selected by AUTOR to exhibit at Autor Fair 2017. – august 2017: I was selected by Myday-byday gallery in Rome for a promotion shipservice dedicated to contemporary jewelry artists. – march 2018: I was introduced by MuDeFri (Friuli Venezia Giulia design museum) in the exhibition on the census of the women designers of Friuli Venezia Giulia. – 3-10 march 2018: my works were shown at the collective exhibition WOMEN DESIGNER IN FVG at the Tina Modotti gallery in Udine during the Udine deign week. – april 2018: I was selected by Adornment – Curating Contemporary Art Jewery to show at the exibition project No Matter Matters on the occasion of Milan Design Week 2018. – june 2018: the Benchpeg online magazine dedicated an article to my Sea Bed collection. – november 2018: I was selected by ESH Gallery to show at the exibition Walking Treasures III in MIlan.